Today I'm at Indian Quilling Challenge Blog with the Birthday Blog hop DT post. 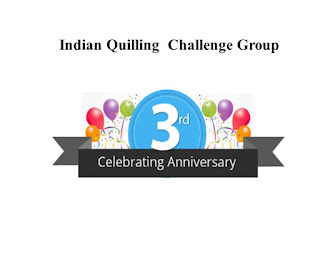 This month we are celebrating 3rd Birthday of IQCG Challenge and I am so excited to be a part of this awesome group as a DT. This month there will be no quilling contest!!!! Our team will showcase birthday inspiration throughout the month on the below scheduled dates. Exciting prizes from our sponsors will be given to one winner selected from the comments across all the blogs in the hop. One random winner will be chosen by our DTs and they will get a special goodie bag from us.